In the "gold rush" town of Paracale that sits on gold (whose gold was alleged to be by an ex-president), stands the old stone Church of Our Lady of Candelaria (Our Lady of Candles), which is celebrating its 400th anniversary. Paracale is a gateway port to Maculabo Island and the Calaguas Group of Islands, home to Mahabang Buhangin, about 1.5 hours away from Paracale port. 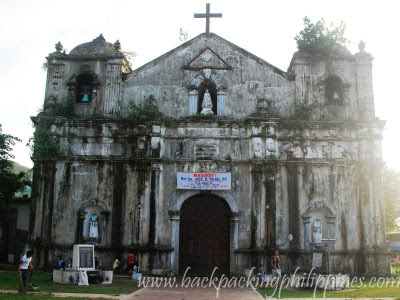 If you want some sort of Visita Iglesia Camarines Norte you can also try Saint Peter's Parish Church (Vinzons Church), Parish of St. John, the Evangelist (Labo Church), (Capalonga Church, not really old but it's home to the venerated Black Nazarene).